love experimenting with new hair styles or applying make-up? spend forever scrolling through Instagram checking out the latest celeb hair and make-up trends? love the idea of working in a luxurious beauty spa? dream about working in media make-up and special effects? If any of this sounds just like you, one of our hair and beauty study programmes is the perfect match. Our hair and beauty department has built a reputation amongst employers as the best in the city. We’ll show you everything you need to make it in the industry by working on paying clients in a real salon environment. This is where our Revive salon comes in. At our City Campus you’ll find Revive, a real working salon with real paying customers. You’ll learn everything from working on reception to ordering products; creating price lists, special events and treating customers. We’ll teach you what you need to know to work in a salon, hairdressers, spa, on set, or to set up your own business. That said, beauty doesn’t just have to be confined to a salon environment. Our media make-up programmes prepare you for careers on film, theatre and tv sets by exploring the latest special effects make-up and techniques. During your time with us we’ll help you to shine and get spotted by employers. Our students take part in various competitions throughout the year where you’ll get to showcase the skills you’ve learnt and test yourself against national competition. We know that in today’s environment not only will you need hair and beauty skills, you’ll also need to learn how to run a business, deal with customers, manage a company and so much more. That’s why our study programmes aim to make you work ready – something today’s employers love to see. All of our tutors at The Sheffield College have one thing in common - passion for their area! Our hair and beauty tutors come from a wide variety of backgrounds, many having worked in the industry before becoming tutors. This means that not only do they possess expert knowledge of their chosen specialism, but they can also pass down the professional skills you'll need for a successful career in the hair and beauty industry. What's more, many of our tutors still have links with their former businesses and employers, which means that they can advise you on obtaining a work experience placement or offer you interview tips. During your time with us we’ll help you to shine and get spotted by employers. Our students take part in various competitions throughout the year where you’ll get to showcase the skills you’ve learnt and test yourself against national competition. We also regularly invite in guest lecturers and speakers so that you can get an idea of what it really takes to make it in this competitive industry. Most recently we've had wig-maker and make-up artist, Ella Burton, attend the college for a full demonstration of her incredible hair and make-up artistry. The hair and beauty training facilities at our City Campus are second to none! We have numerous custom-built, professionally equipped training salons where you will learn to perform all of the treatments and cutting skills required to work as a professional hairdresser, barber or beautician. Each training salon is equipped with industry-standard sinks, mirrors and chairs, as well as all of the same professional quality tools and equipment that you would expect to find in a commercial salon. Use the button to the left to take a virtual tour around our facilities. On top of your day-to-day learning, you will also have the opportunity to gain work experience in our fully-operational salon, Revive (more on that below!). At The Sheffield College, we know the importance that hands-on experience plays not only in your education, but also in your chances of finding employment once you finish your journey with us, particularly in such a vocational industry! That's why all of our hair and beauty study programmes provide you with the essential practical experience in our industry-standard salons. You will also have the opportunity to gain work experience in our fully operational commercial salon, Revive. Here you will interact with paying customers so you can get to grips with all aspects of the hair and beauty industry, from welcoming clients and undertaking treatment analyses, to cutting and styling hair and recommending products, all things that will form part of your day-to-day workload once you enter employment. 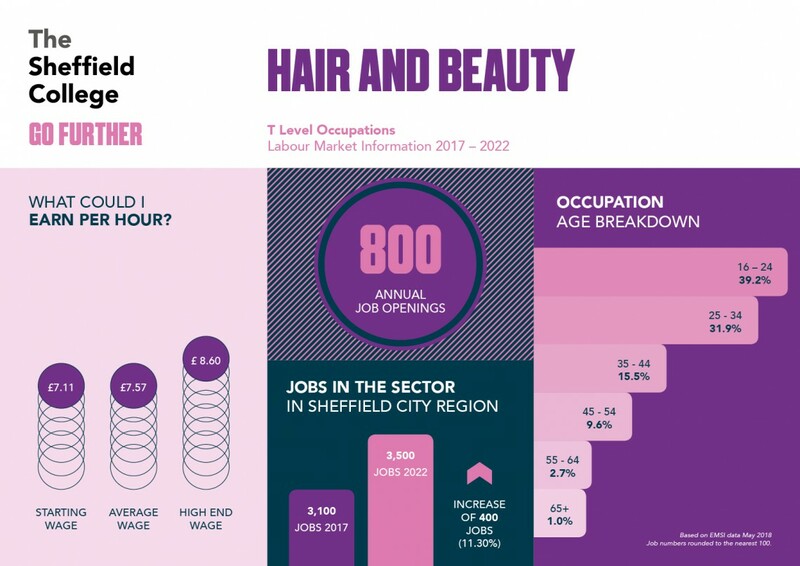 Job openings in the hair and beauty sector are on the rise, with 400 new positions set to open up in the Sheffield City Region by 2022. You can access additional careers information using our online toolkit, Career Coach. This online platform will enable you to access information about various job roles within the sector, average wages and career prospects, as well as live job vacancies and tips for creating your CV. 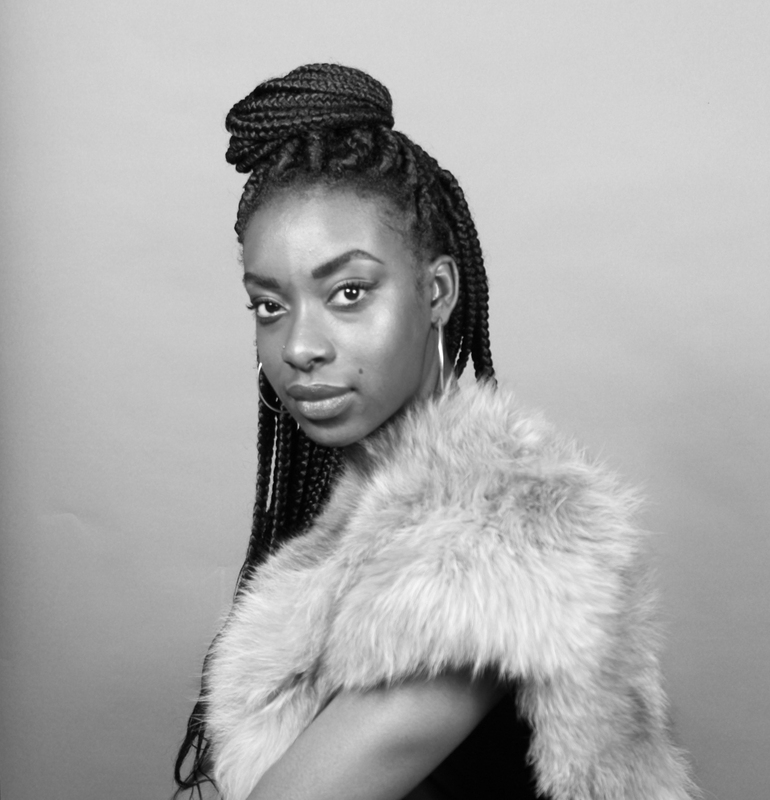 "One of the most important things I learnt was how to do a budget so I am able to work as a freelance make-up artist."